The methodology of Gigamapping and the supporting methods and techniques do have several ways of validating the work. However, this is not enough to make sure the maps are valid. Additional attention needs to be paid to the information build-up in the project. How reliable is the information? Have we interpreted the interrelations in the best way possible? The different modes are listed and described below. Gathering information: Make sure you check and double-check information. Information given by singular informants should be triangulated by asking others or by using other types of data. Framing: The Gigamapping process is great for framing the project and research area because of its flexible boundary critique. The strategy of first mapping without filtering out seemingly irrelevant issues ensures you will cover a wider territory than what you assumed from the start. To withdraw from these territories after checking them, draw a relevant boundary in an informed way. Another effect is that during the process one becomes more knowledgeable about the bigger field at hand. This influences the conception of the systems boundaries. Reframing the boundaries, by enlarging or shrinking them during the process ensures a reflected development and boundary critique. Coding of information value: We advise using colour or font coding or annotations to target, describe and rank information quality on the map. Such coding can distinguish among the a priori given, hard facts, well-triangulated qualitative data, common knowledge, interpretations, informed guestimations and sheer assumptions. Because the information is coded on the Gigamap it is contextualised and situated. Therefore, it is possible to analyse the importance of the information and if it needs improvement. The coding can then be used to refine and triangulate information that is crucial. ZIP analysis: The zoom in the ZIP analysis helps to improve the resolution of information on the map and to distinguish between less important areas to zoom in on and those that are crucial. Additional information gathering and interpretation must be made. Expert co-designing: Building expert networks is central in SOD. The experts should be knowledgeable about different types of information. For example, experts from health care should be interpolated with expert patients. Back-checking: The information gathered is always situated on the Gigamap. When starting to work with design resolutions and interventions, you can back check in detail how the suggestion fits the research and where it leaves uncertainties that require additional investigations. Together, these different modes, if conducted in a good manner, construct the evidence found on the Gigamaps. ‘Gigamaps send our eyes into places where our eyes can’t go’. Here are some related appraoches that are derived from Gigamapping. Common to them is that they are narrower framed than the Gigamap and they are more specialised towards a purpose. The Gigamap is intentionally left open and general as well as process oriented. This paper presents a framework and process for a visual language that is developing as a systemic visual method, and to integrate and outline aspects of this synthetic map formulation as the “synthesis map” both with reference to contributing authors, but also as a comparison to design principles and the method of visual design language. In this way the technique’s purpose as an emergent and creative tool ‐ method can be illustrated, in contrast to the approaches of infographics, and other visual map making associated with design ideation, and design schema representation. 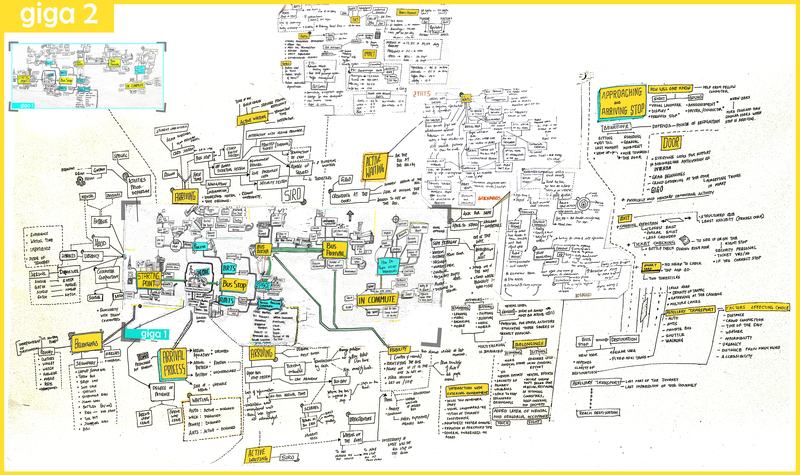 Synthesis maps integrate evidence and expertise in a visual narrative for knowledge translation and communication. CanIMPACT Clinical Synthesis Map. © 2016 OCADU Strategic Innovation Lab. Layered scenario mapping is a technique used to gain insight into the ‘situation one designs for’.It is a systemic technique and emphasises presenting information in different layers going from an overview to very detailed information. The technique proposes a structured approach to collecting and presenting data and provides a template for sorting and presenting the data in a layered manner hierarchically, spatially, and temporally. In a paper1 published in CoDesign I introduce Layered Scenario Mapping, a mapping technique we developed in the Ulstein Bridge Concept project to address issues we had with coping with vast amounts of data from field research. The technique was developed to meet the needs we faced when designing a ship’s bridge, however, it may also prove valuable when designing for other contexts where the spatial and/or temporal dimensions are of importance. A guide enabling others to use the technique is available online. to present the situation we designed for at the level of granularity necessary to gain an in-depth level of understanding. Layered Scenario Mapping is a systemic design method aimed at helping designers understand the system they design for. The resulting map represents this system. Our map layout consists of overview information to the left and detailed information to the right. The overview provides the reader with a frame of reference to use when deciphering the detailed information. In our map the overview includes a descriptive title, a visual presentation of the ship’s technical specifications, a description of the scene and introduction to the scenario, a presentation of the actors involved in the scenario, a written scenario story, and document information. illustrative photos to provide contextual information. We found that the map made it easier to make use of data from different sources. The way the data had been filtered, sorted, and put into a framework made the data more accessible and easier to share among the team. The description of what happens in the timeline matrix was the most-used part of the map, and the visual elements were particularly important in gaining a broader understanding of the scenario. We used the map individually when developing design ideas and in collaborative sessions to discuss the appropriateness of ideas. The map invited comments, corrections, and clarifying questions, and thus facilitated mutual knowledge development. The map became a ‘boundary object’6 that we used internally within the project team, and also in communication with users and other stakeholders. For an in-depth discussion on our experiences with the map and a review of its appropriateness, see the CoDesign paper. Layered Scenario Mapping can be developed further, in many directions. The content of the map could be elaborated upon and expanded. As an example, we mapped out the scenario from the deck officers perspective only and believe we could have gained broader insight if we had also mapped out the scenario from the perspectives of several actors. Also, due to limited time, we made a paper-based map only. A digitised version could ease sharing and exploring the digital material collected during field studies. The guide describing the technique is not intended as a definitive recipe, but rather meant as a useful starting point for others who would like to do their own Layered Scenario Mapping. I encourage others to develop the technique further! 1 Lurås, Sigrun. 2015. “Layered Scenario Mapping: A Multidimensional Mapping Technique for Collaborative Design.” CoDesign. doi:10.1080/15710882.2015.1072221. 2 See for example: Carroll, John M, ed. 1995. Scenario-Based Design: Envisioning Work and Te.chnology in Systems Development. New York: Wiley. Buxton, Bill. 2007. Sketching User Experiences: Getting the Design Right and the Right Design. San Francisco, CA: Morgan Kaufmann. Bødker, Susanne. 2000. “Scenarios in User-centred Design – Setting the Stage for Reflection and Action.” Interacting with Computers 13 (1): 61–75. 3 Kirwan, Barry, and Les K Ainsworth. 1992. A Guide to Task Analysis. London: Taylor & Francis. 4 Sleeswijk Visser, Froukje, Pieter Jan Stappers, Remko van der Lugt, and Elizabeth B-N Sanders. 2005. “Contextmapping: Experiences from Practice.” CoDesign 1 (2): 119–149. 5 Beyer, Hugh, and Karen Holtzblatt. 1998. Contextual Design : Defining Customer-Centered Systems. San Fransisco, Calif: Morgan Kaufmann. 6 Star, Susan Leigh, and James R. Griesemer. 1989. “Institutional Ecology, ‘Translations’ and Boundary Objects: Amateurs and Professionals in Berkeley’s Museum of Vertebrate Zoology, 1907–39.” Social Studies of Science 19 (3): 387–420. Here is a compilation of sources to gigamapping found on the internet. The list of links is very inclusive.